There’s a whole list of dishes and ingredients I really want to like — portabella, escargot, goat cheese — but just can’t. At least not until those ingredients are in the hands of the right chef. I’m not, for example, a fan of crab. Maybe it’s the name — crab — as in the crabby, frowny faces on diners muscling through crab legs at all-you-can-eat buffets. All that cracking, snipping and scooping for wee bits that, if poor quality, only taste good, like most things, drenched in butter. Or maybe it’s the grumpiness from crab cakes improperly seasoned, overcooked or more breading than meat. Then there’s that crabs-are-spiders connection (creepy), a visual that Deadliest Catch does little to dispel. It’s also not cheap to make at home or take a gamble on when dining out. And because regular crab is not the same as soft-shell crab — which I adored fresh growing up on the Jersey shore — it never tastes as good as I remember it. Yet optimism prevailed this past summer when Mr. Meat-and-Potatoes and I ordered crab at Seasons of Coeur d’Alene. Fueled by enthusiasm for executive chef Scott Miller, whose prior dishes ranged from very good to outstanding, the Crabby Cakes not only made me a fan, they top out my list of favorites. Even better, Miller, who got a taste for French cooking as a teenager working at his family’s restaurant in Arizona, swayed me while incorporating another of my least favorite ingredients: jalapeno. The jalapeno, says Miller, was actually the inspiration for the crab cake recipe. A springtime tequila-themed dinner at Seasons had Miller developing a candied jalapeno relish to accompany a Mexican wedding cookie dessert. “A full-flavored crab cake in our bar area just felt like the natural delicious vehicle to share the relish.” says Miller, who incorporated it and the candied jalapenos into a bright, crunchy companion in search of the perfect match. The item has remained popular enough for the dinner menu, and has been a staple since its July debut. Seasons starts with five ounces of canned blue swimming crab, so the dish is available year round. Found along Asia’s coast, blue swimming crab is similar to the highly prized, tender white meat from Chesapeake blue crab, which Miller also incorporates when in season. Binding and seasonings are minimal: finely-chopped celery, sweet red pepper, mayonnaise, whole cage-free eggs and English dry mustard. Just enough to hold the meat together, but not so much as to overpower the delicate, sweet, almost nutty flavor of the crab. Panko bread crumbs and a dusting of flat leaf parsley are the last stage before the chubby little patties are seared in clarified butter. Crab cake “sliders” are served warm on a griddled soft bun with homemade tartar sauce (made from caramelized Walla Walla onions) and fried basil leaves. Jalapeno-sweet corn relish adds enough crunch and punch to heighten the crab flavor and foil its buttery richness. The corn is especially complementary to the crab in taste, texture and nostalgic appeal, reminiscent of clam bakes and seafood festivals growing up. 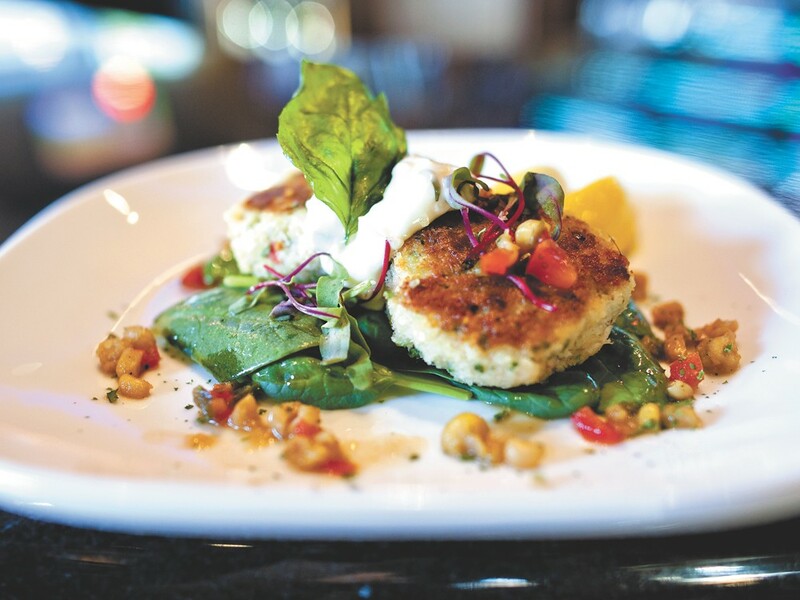 For crab fans, Seasons’ crab cakes should rank in their top 10. And if you’ve never tried crab, this dish sets a standard against which others will be measured. A real win-win.